Ecosystem Models have applications in a wide variety of disciplines, such as: natural resource management, ecotoxicology and environmental health, agriculture, and wildlife conservation. There are two major types of ecological models: analytic models and simulation/computational models. Analytic models are often more complex mathematically, and work best when dealing with relatively simple (often linear) systems that can be accurately described by a set of mathematical equations whose behavior is well known. Simulation models use numerical techniques to solve problems for which analytic solutions are impractical or impossible. Simulation models tend to be more widely used, and are generally considered more ecologically realistic. After construction, models are validated to ensure that the results are acceptably accurate or realistic. We have developed a prototype spatial dynamic multispecies model (Luo et al. 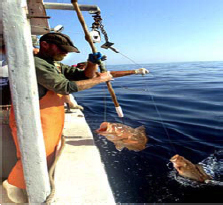 2005) to study the dynamic interactions of the Atlantic coastal fisheries ecosystem from Nova Scotia, Canada to Miami, Florida. The model is derivative of a spatial biophysical model developed for south Florida (Ault et al. 1999, 2003; Wang et al. 2003; Humston et al. 2004). The spatial fishery ecosystem model was designed to allow evaluation of how fishery management actions may impact fishery yields and stock productivity goals for a particular target species when the species complex is directly coupled to spatial patterns of fishing intensity, other predator and prey populations, ocean physics, and environmental changes. 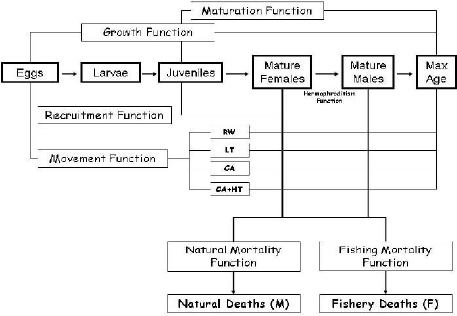 In the model, we use both age-structured population dynamic and bioenergetic data layers for functional fish groups such as striped bass, bluefish, weakfish, and menhaden. These data layers reflect linkages via species onto genetic usages of habitats, differing life histories and population-dynamic strategies including their critical placement in the trophodynamic structure of the ecosystem; and, responses to fishing, predator-prey relationships, ocean biophysics, and fishery management interventions and alternatives. 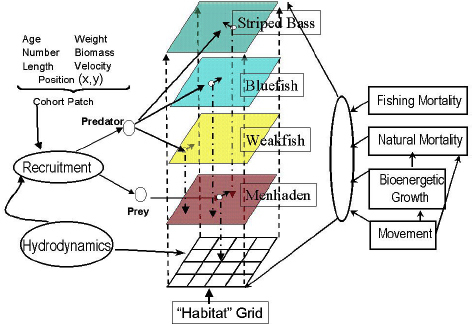 Conceptual model of the multispecies fishery for the spatial dynamic coupled prey-predator and human-dominated biophysical environment of menhaden, bluefish, striped bass, and weakfish. The numerical spatial dynamic model tracks the abundance and spatial dynamics of cohorts of a key prey (N1(a, t)), a secondary prey (N2(a, t)), predator1, P1(a, t), and predator2, P2(a, t) at age a and time t in horizontal space from spawning, through settlement and recruitment, and as they grow through maturity to maximum size and age. To accomplish this, the model mathematically links bioenergetic principles of fish physiology, population ecology, fish-habitat relationships, and community trophodynamics to regional hydrodynamic circulation models. The model strikes a balance between the highly articulated individual-based models and contemporaneous applied population and community models. The model is object-oriented with population-community dynamics considered in terms of the independent variables age and time, but also two-dimensional (x,y) space dependency. Each predator or prey species in the model is represented as a layer in a trophodynamic food web, which includes ms cohorts (age classes), linked to a spatial habitat grid. All cohorts for every species (both prey and predators) are divided into n number of recruit patches which are transported to settlement areas as planktonic organisms by advective hydrodynamic currents and behavioral responses to environmental gradients. Every patch contains general and unique instantaneous information on age, weight, length, abundance, biomass, swimming velocity, and geographic position. The spatial dynamic model follows each of these patches over both space and time with fewer tactical assumptions about animal behavior than individual-based models. Two interacting model spatial domains are used: (1) a continuous domain for recruitment life stage processes and behavioral movements of adults for both prey and predator(s); and, (2) a discrete habitat domain for all environmental data (e.g., depths, salinity, temperatures, phytoplankton abundance, substrates, etc.). Interactions can happen at any time or space point among any layers either through prey availability, predation loss, or competition for prey. As the number of species and age classes increase in the model, a single workstation is no longer sufficient to obtain results in reasonable time frame. The current model is structured to take the advantage of the recent development of the parallel computing cluster systems. In the cluster computing system, each age class of a species can be computed and the information are summarized at each node at each time step (t). The summarized information for each age class of each species are received by the master node and distributed to the slave nodes for simulation at next time step (t+1). Therefore, as the number increase of species and age classes increase in the model, we can add more computing nodes to the cluster system to balance the needs. As such, the model will assist establishment of quantitative ecological measures of fishery management success for the Atlantic States Marine Fisheries Commission and other regional US fishery management entities. Ault, J.S., Luo, J., Smith, S.G., Serafy, J.E., Wang, J.D., Humston, R. and G.A. Diaz. 1999. A spatial dynamic multistock production model. Canadian Journal of Fisheries and Aquatic Sciences 56(S1):4-25. Ault, J.S., Luo, J., and J.D. Wang. 2003. A spatial ecosystem model to assess spotted seatrout population risks from exploitation and environmental changes. Chapter 15, Pages 267-296 in Biology of Spotted Seatrout. S.A. Bortone (ed.). CRC Press, Boca Raton, Florida. Humston, R., Olson, D.B., and J.S. Ault. 2004. Behavioral assumptions in models of fish movement and their influence on population dynamics. Transactions of the American Fisheries Society 133:1304-1328. Luo, J., Ault, J.S., Olson, D.B., and A. McCrea. 2005. A spatial ecosystem model for Atlantic coast multispecies fisheries assessments of menhaden and bluefish. Final Report to the Atlantic States Marine Fisheries Commission. 82 p.
Wang, J.D., Luo, J., and J.S. Ault. 2003. Flows, salinity, and some implications for larval transport in south Biscayne Bay, Florida. Bulletin of Marine Science 72(3):695-723. Identifying the scale of marine larval dispersal remains one of the fundamental challenges to marine ecology and oceanography. Most coastal marine species have limited adult movement, so the relatively short, pelagic larval phase represents the primary opportunity for dispersal. Although larvae have the potential for long-distance dispersal, evidence is mounting that larval dispersal may be limited. These studies challenge assumptions about the dominant distance mode of dispersal for marine populations (whether larvae typically travel a long or short distance). The rates, scale, and spatial structure of successful exchange, or connectivity, among local populations of marine organisms drive population replenishment and, therefore, have profound implications for population dynamics and genetics of marine organisms; spatially oriented resource management (e.g., marine protected areas); and the spread of invasive species. However, realistic scaling estimates of connectivity are lacking. With major declines in fishery stocks, rapid degradation of natural coastal habitat, and calls for ecosystem-based management, identification of the spatial scale of population connectivity over demographically relevant time scales is critical. 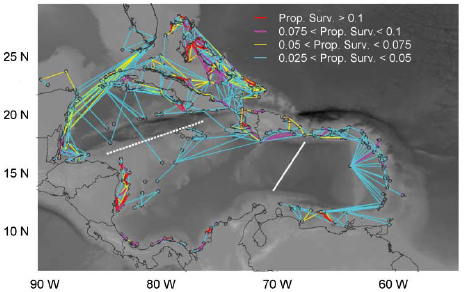 Connectivity network for reef fish populations in the wider Caribbean plotted for various levels of larval exchange (proportion surviving) between each reef site (or node Ni, where center location is represented by a small gray circle; note that there is no directionality represented in the exchange). Two major meridional biogeographic breaks are identified: one in the eastern Caribbean Sea (white line) and the other one at the northern edge of the Nicaraguan Rise (dotted white line), which separate the eastern and western Caribbean. Two enclaves stand out: the Bahamas Bank, including the Turks and Caicos Islands, and the Nicaraguan Archipelago, which are both strongly intraconnected. The Panama-Colombian Gyre subregion is also largely isolated from the rest of the Caribbean, with little connection between Panama and Colombia. Note that connections at levels below 0.05% (proportion surviving) are not likely contributing appreciably to ecological connectivity but are shown here because they may become important when accumulated from different sources at one particular location. In the present connectivity study, velocity fields from MICOM years 1979-1983 (forced by true daily winds of the European Center for Medium-Range Weather Forecasts, ECMWF) were coupled to a particle- tracking code to perform Caribbean-wide simulations of larval dispersal, encompassing coral reef species spawning and settlement sites. An offline Lagrangian code module was developed to track the trajectory of individual particles (larvae) within the fluid as a function of time. The particles were released within the ocean domain and then moved along the underlying model-generated velocity fields by a fourth order Runge-Kutta integration of the Ordinary Differential Equation (S7). Mesoscale to small scale turbulences modify the low frequency mean flow in the region. Therefore, at each time step a random displacement selected from a Gaussian distribution through a Markov process was added to the particles to parameterize the effects of the physical processes occurring at length scales smaller than the resolution of the ocean model (S8, S9), resulting in a diffusivity coefficient of ca. 105 cm2/s. Additional functionality includes the automatic tracking of particles (larvae) from user selected spawning locations. The particles are essentially independent of each other and therefore the model was a good candidate for parallel computation. The parallel implementation of this model used a master-slave paradigm in which the master process reads in the number of particles and distributes a set of these particles to the slave unit. Each slave unit accesses the velocity data from the data files independently and moves the particles for a specified time interval and, when finished, requests more work from the master. The code exhibits a nearly linear scalability and is suitable for high throughput computations. We are developing agent based models to study how individual vessels in the Gulf of Mexico fishery make temporal and spatial decisions about target species, gear selection, and fishing location (Figure 5 shows a grouper catch in the Gulf of Mexico). Often, fisheries that are multi-species and use multiple gears frequently alter their targeting behavior or gear use in response to changing market conditions, legislative action, or temporal and spatial biological changes in abundance. This frequent and unaccounted for redistribution of fishing effort leads to a fleet that is heterogeneous and a catchability coefficient that is not consistent across time or space. These conditions violate the assumptions used to calculate a standardized catch per unit effort index. The operating model being developed will be used to quantify the magnitude and direction of fishing effort redistribution and perform a management strategy evaluation for management options under consideration by the Gulf of Mexico Fishery Management Council. Model results will indicate how fishing effort redistribution contributes added variance to the calculation of a standardized catch per unit of effort index. This information will be ultimately used to predict a nonlinear catch per unit of effort model, which includes parameters and variables that accommodate a dynamic catchability due to temporal and spatial effort redistribution. SOSMPAS extends traditional population dynamics methods into a spatial context to allow simulation of spatially-explicit processes such as the establishment of marine reserves of various sizes as well as the creation of multiple reserve networks. As this model seeks to investigate the spatially-explicit stochastic impacts of individual movement across reserve boundaries and consequent vulnerability to fishing effort, it is necessarily individual-based. SOSMPAS is implemented in the Java RePast Ecological Modeling Toolkit. 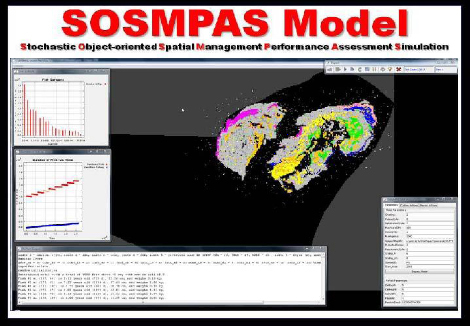 SOSMPAS provides the framework for a robust, quantitative approach to addressing numerous theoretical questions pertaining to spatial fisheries management decision-making. The model uses three main Java classes; one managing the simulation, one representing an individual fish, and one representing the Tortugas region of 193 x 147 distinct grid cells, each corresponding to a 200 m x 200 m Reef Visual Census primary sampling unit. Each primary sampling unit will be assigned a habitat type as determined by RVC surveys and aerial photography; a depth as determined by RVC surveys, Light Detecting and Ranging surveys (LIDAR), and multibeam sonar bathymetry data; and a protection status based on management decisions (fishable or unfishable). Simulated fish populations are instantiated into the model based upon observed densities from the RVC, leading to high processing requirements. The model runs 20 year simulations in 5 minute time steps. Movements are based upon empirical data collected by the University of Miami Reef Fish Tracking Project. The model examines 3 different life history types under 3 different movement scenarios, 3 different movement speeds, and 3 different management scenarios. Each parameter permutation will be run 10 times to generate confidence intervals around output means. Outputs will be compared at 2, 5, and 20 year intervals. MASTHEAD IMAGE used with permission from Defense Coastal/Estuarine Research Program (DCERP), Marine Corps Base, Camp Lejeune.